Another great rehearsal day today, Adult cast members took a day off work; Some brought their laptops as did some of the children but I suspect the children mostly played games on theirs! We had a great rehearsal day today and, as you can see, we also had a lot of laughs! 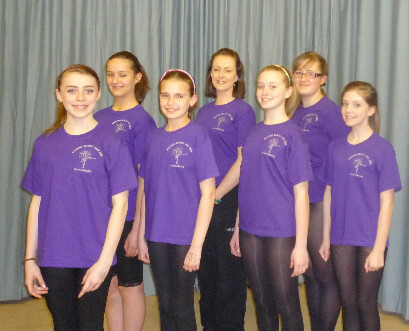 The Garland Dancers had a make-up session after our rehearsals - don't they look great? the fairies are practising with their magic dust! Claire and the girls showing off their new Sleeping Beauty t-shirts! Only 2 weeks to go now! Claire and I have made an important decision over the Christmas holidays - we have decided to move our Sleeping Beauty to Arlington Arts Centre. Here's why.. The backstage area is much more spacious - plenty of dressing rooms and much more secure for the children. Ample and free car parking. A more relaxed atmosphere with a Friday dress & technical rehearsal which can start and finish earlier - much more suitable for our very young dancers.